Will conflicts over resources spill across borders? The world's population, currently 7.6 billion, is expected to peak later this century at 11.2 billion, and possibly much more, before slowly declining. 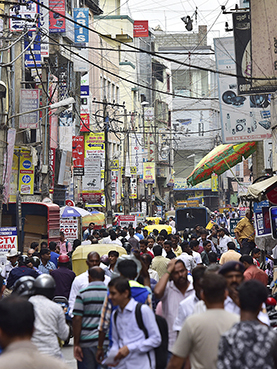 Countries such as Japan and Germany already are seeing declines, but others, such as Niger and India, are projected to explode in population in coming years. Some experts downplay the potential effects of a rising global count, but many say strains on natural resources will be intense, leading to conflicts over land, water, food and energy, and sparking mass migrations from poorer to wealthier regions. Yet experts differ on how best to manage the world's population pressures. Some say that with greater access to contraception, women in developing countries will choose to have fewer children. Others say a better approach is to conserve precious natural resources by reducing personal consumption. Meanwhile, the Trump administration, following through on a campaign promise, has cut off U.S. funding for international family planning programs, triggering an outcry from some aid organizations.